Lilliputians in the background worry whether they can survive Obama’s travels. 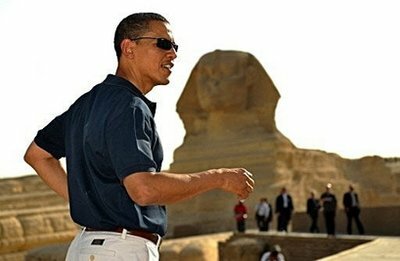 Chris Matthews: He represents majesty and ancient wisdom – and the Sphinx isn’t bad either. My legs are all tingly. The guy toiling in the pit was supposed to be laid off last week-Another job saved! Put some wheels on this bad boy and I think GM’s got a real winner. The little Americans will shape a mountain in my image or I will crush them like this. How did Obama crush America? It was like a camera trick. Just wait until they see my head on, um… Mt… what’s that place called? You know, the 57th State. South Dakota? North Dakota? The Great Sphinx meets the Great Sphincter. Yep, I want one just like it on the White House lawn with my face on it. Use some of that ‘stimulus’ money. Thought Balloon: Are these little people actually real? But they look so small in comparison to the Sphinx and me! I wonder if I should send them some stimulus money? Let’s see, what comes after a trillion? Don’t hate me because I’m pretty. Think of all the jobs it enslaved, uhhh I mean….saved…saved! See! I told you that my head was bigger than his! ONe of these things is a national icon recognized by millions as an Icon and if it’s press is to be beileved is supposedly very wise but in reality doesnt have a clue. THe other is the Sphinx. 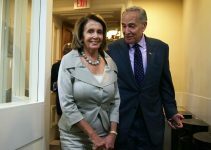 Two big heads but zero IQ between between them. Obama – “As my ancestor the Pharoah once told his advisors about Moses – “Let him speak so that men know he is mad” . Who knows? A few thousand years buried up to my neck in sand, and even I could become valuable. But would anyone dig me out? The sphinx bows in honor of the return of Ramses. Press Secretary Robert Gibbs stated, “For this special day President Obama insisted his iPod be loaded with nothing other than the two BeeGees hits: Jive Talkin’ and Stayin’ Alive”. “Next I visit Israel and carve my likeness on the wailing wall..
That’s not the Spinks I knew. Is this where they filmed the Scorpion King? This is how you handle the Republican in Congress (or anyone else that may get in my way). First you strand them in the desert and then you crush them. And so let it be written: The uncanny connection of ageless meeting the mindless.